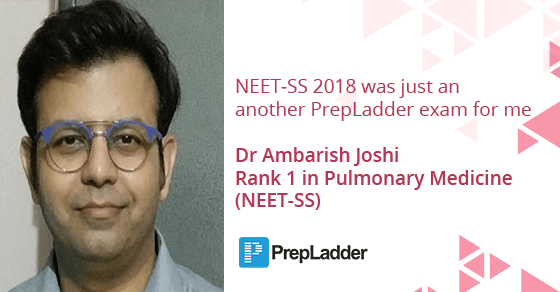 PrepLadder congratulates Dr Ambarish Joshi on securing Rank 1 in Pulmonary Medicine Super-Specialty. We wish him all the best in his career and future ahead. I am Dr Ambarish Joshi, did my MBBS from JJMMC Davangere Karnataka and my MD in Pulmonary Medicine from King George's Medical University Lucknow. I scored NEET-SS Rank 1 in Pulmonary Medicine Super-Specialty. What do you think is the correct approach to study for NEET SS? Only MCQ's or Theory+MCQ's? I feel we should set small-small targets during our preparation. A blend of theory along with mcqs is must. Also timely thorough revision including revision of important memory based mcqs from various topics should be done before exams. Medicine and Pulmonary Medicine should be read in ratio of 30 and 70 as we don't have any DM entrance book of Pulmonary Medicine mcqs. Obviously the day one is determined to prepare honestly. Fishman for Pulmonology, Light's for pleural diseases.. Recent guidelines..Paul Marino for Critical care , have also read various topics from up-to-date. Medicine I have read mostly from Harrison. Have you attempted any SS exam previously? If yes, what were your ranks then and what did you do different this time that lead to your success? Yes I have qualified twice in AIIMS written DM entrance in November and April. I also wrote NEET last year but could only settle with a rank of 51 in Pulmonary Medicine. This time I have made a strong strategy dividing Medicine and Pulmonary Medicine and worked accordingly. Also, I revised atleast 80 percent of topics that I read. How big is the role of practice and revision while preparing for NEET SS and how much time should be dedicated for it? Revision revision and revision is the oxygen of cracking. Continuously practicing MCQs also sharpens your approach and relieves anxiety before exams. Yes of course. I have made short Targets and tried to work. Yes of course sincere thanks and I could only say that NEET-SS 2018 was just an another PrepLadder exam for me..I opted for DM Cardiology pack thinking of sharpening my medicine concepts and it really helped..I strongly recommend PrepLadder. Were you a topper or a mediocre student during MD/ MS? I was always an average student. Most difficult Neurology and easiest was Rheumatology (yes, I found Pulmonology tough). One mistake that you believe everyone must avoid while preparing for NEET SS. Please make a plan else you wouldn't succeed because in our speciality margin of error is very very less. Be confident , don't get frustrated during preparation and most important never give up. We thank Dr Ambarish Joshi for sharing his success story.